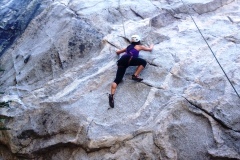 Mammoth Lakes and the surrounding areas provide world-class climbing opportunities. Whether it's Mammoth Rock, the Owens River Gorge, Tuolomne Meadows, or spectacular Half Dome in Yosemite National Park, you won't easily duplicate our geography's challenges. For those novices and first time adventurers, Mammoth Mountain offers a rigorous climbing wall that individuals and families alike will enjoy.